"An awesome poblano sauce I found that is perfect for topping a taco or fajita or for cooking or adding to chicken." Set oven rack about 6 inches from the heat source and preheat the oven's broiler. Place the pepper cut side-down on a baking sheet. Broil in the preheated oven until skin is blackened, 8 to 14 minutes. Place the pepper in a resealable plastic bag. Cool until well sweated and safe to handle, about 20 minutes. Skin the peppers by gently pinching them off. 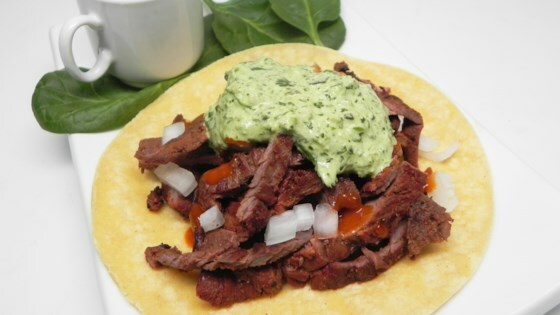 Place the skinned pepper, mayonnaise, cilantro, green onion, lime juice, and garlic in a blender. Cover and puree until smooth. You can substitute the mayonnaise with sour cream or Greek yogurt. Fresh lime juice may be substituted for bottled lime juice. I use a Ninja® blender. Great as written! No changes necessary. I would like to try it with Greek yogurt but then again, why try to fix what isn't broken?